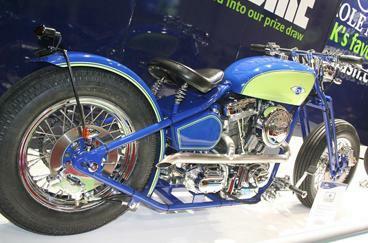 It's your last chance to win the Carole Nash Old Skool Bobber that was built live before crowds at the NEC motorcycle show. To be in with a chance to win the bobber, worth an estimated £30,000, all you need do is get a motorcycle insurance quote from Carole Nash and regardless of whether you then take out cover with the company you will be automatically entered. The draw closes midnight this Saturday (October 31st), so act fast. The bobber is built around a goosenecked Santee rigid frame and powered by a throaty Revtech 88ci 1450cc polished motor fitted with Mikuni Carb, it incorporates a number of neat Hawg touches. These include a bespoke stainless steel 2-into-1 exhaust with vintage slip-on muffler and hand-made rear fender and fuel tank. It took over 400 man hours of hard graft and creative ingenuity to craft the custom chop – it’ll take significantly less time to earn your chance to win it. Simply log on to www.carolenash.com or call 0800 458 2613 to get a no obligation quote.